Advantage PTS & CPTS pump tank stations with mild or stainless steel reservoirs use banding to increase tank wall strength without increasing wall thickness. 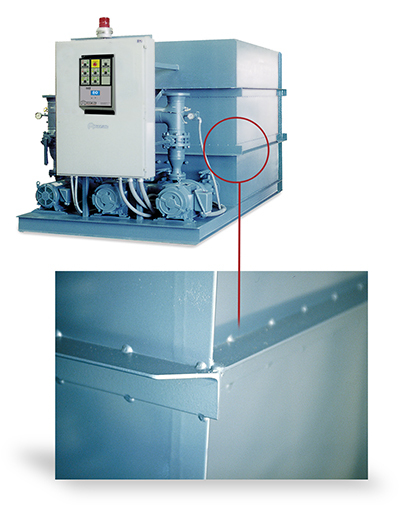 The Slenderness Ratio is used to compare strength of wall thickness and height and is a measure of tank strength. A lower ratio means a stronger tank. Competitive tanks that do not use banding must used a thicker wall to equal the Advantage slenderness ratio. Thicker walls mean increased product weight and shipping costs for comparable size tanks. For more information about slenderness ratio and tank banding call the Advantage Sales Department at 317-887-0729. Would you like to Download FYI #146 to your browser?